For those who use Evernote as a to-do list application, the service just became more useful today with the launch of a much-requested feature: reminders. Available to both Evernote and Evernote Business users on Mac, iOS and web (to start), the option now appears as an alarm clock icon at the top-right of the note on Mac and web, and the bottom of the note on mobile (iPhone and iPad). Though a seemingly minor addition, the feature actually addresses the top three user requests, Evenote’s VP of Marketing, Andrew Sinkov, explains in the official announcement about the release. Besides the reminders themselves, users wanted a way to more quickly created note-based to-do lists as well as pin notes to the top of their Note list. Now, all of these items are supported. Reminders are simple to use – you just click the button, add a time and time, and then you’ll get both an in-app alarm as well as an optional email when a reminder is due. The note title will also appear in a new section at the top of your Note list, and you can reorganize Reminders by dragging them around. When the task is complete, you tap the check or, on iOS, swipe to remove the Reminder from your list. Though everyday organizers will appreciate the addition, of course, the feature is also useful for Business users, and it’s supported in Evernote’s shared notebooks. The end result turns a shared notebook into a something that’s sort of like a very basic project management utility. Evernote itself uses Reminders for the company’s Video Projects, Sinkov says. Reminders could also appeal as an alternative to the common hack of using Calendar appointments when all you really needed was a simple reminder, not a scheduled meeting. Evernote makes a few other suggestions for Reminders which also see in encroaching more into the calendaring space, including birthday reminders and doctor’s appointments (with notes and questions attached), as well as packing checklists. The company has been busy expanding its feature set designed for business users in recent months, having not only taken the app to new markets, including a localized version for China, but also enabling enterprise-ready options like a Business Library, Related Notes, and improved search. This new Reminders option is something personal and business users would both want, however. 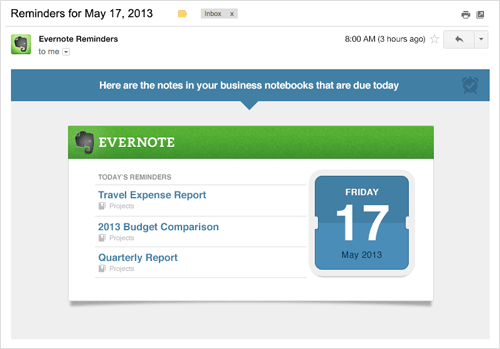 Evernote is now working to bring the Reminders feature to other platforms, and expand its functionality in the future.